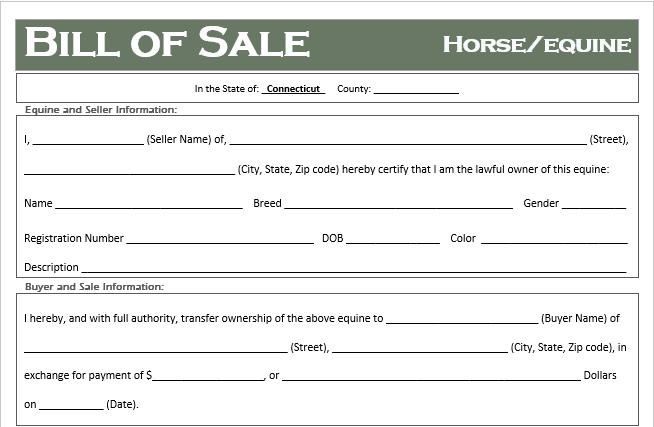 When purchasing or selling a horse in Connecticut you always want to document the transfer of the equine from the seller to the buyer. We suggest securing a valid bill of sale to properly document the sale including the sales price, buyer and seller warranties and details regarding the health condition of the equine. 1. Horses can be very expensive. Whether you giving or receiving cash for an item, you want proof of the transaction in the event someone makes a claim against ownership (if you are the buyer) or if someone is injured on the horse (if you are the seller). It is a simple form of insurance. In short, a properly executed Bill of Sale will protect you from future liabilities. Competant Parties and Legal Intent: Both parties entering the contract must be competant (age, mental capacity, and not impaired or forced). The contract is also valid only if it is lawful. A contract to complete an illegal act is not binding. We also suggest both the seller keep a copy of the Bill of Sale, and the buyer keep the original. This will ensure the seller can document the sale of their equine if property is damaged or someone is injured during its use.